Join a ready-made band with 6 fun instruments! 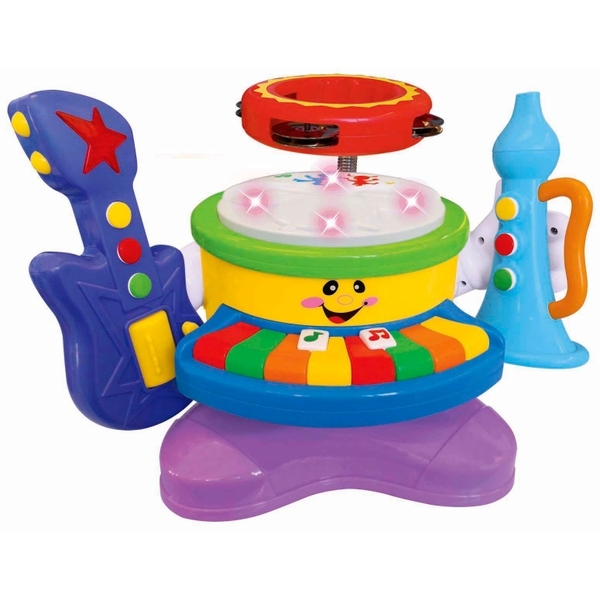 The Big Steps Groove 6- in-1 Musical Band features a colourful keyboard and a light up drum, plus a removable electric guitar, maraca, tambourine and trumpet. Brightly coloured and full of excitement, this toy band plays fun music with dancing lights. Hear demo songs in 5 instrument sounds and experiment with sound and rhythm. Little ones can shake the maraca and tambourine to rattle to the rhythm, and press the colourful buttons on the guitar and trumpet to hear different sounds. With the Big Steps Groove 6-in-1 Musical Band, kids can rock out on the drum, or play the 8-note keyboard. Whether they play with friends or as a one-tot band, they’re sure to fall in love with the beat. Experimenting with music can help children to find patterns, problem- solve and answer the question, "what if?" Every musical performance is an act of creativity and communication. Improvising rhythms as self-expression canelp children develop a lifelong love of music. Communication starts with listening. Exploring sound and rhythm helps children to develop memory, pattern-seeing and problem-solving skills. EU Warning: Not suitable for children under the age of 18 months.